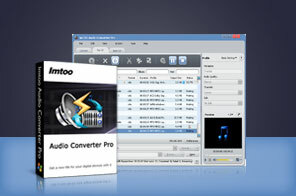 Assembling the functionalities of audio converting, audio extracting, CD converting and CD burning in one tool, ImTOO Audio Converter Pro provides the most comprehensive solutions for music fans to transform between different audio formats, extract audio from popular HD and general video formats, convert CDs to music files and burn music CD from audio/video files. Additionally, you can output different-format files from a single track at once, clip audio segments, split tracks, and make adjustments to the output parameters. Come to experience the high-speed and great-quality audio conversion, CD converting and burning with ImTOO Audio Converter Pro now. Convert CDs to music files in any popular audio format of your choice. Burn your favorite songs and videos onto CD for playback on CD players. Support display and edit ID3 V2 information (users can attach cover, lyric and etc information for the music file). Retrieve general information of CDs. Utilize installer to reduce the installation time. Set effects (incl. fade-in, fade-out, volume normalize, band pass, chorus, flanger, echo and speed) for the outputted audio files. Convert/convert and transfer CDs/videos/audio to your iPod, iPhone and PSP in one step. Output various format files from a single video/audio file or CD track at one time. Extract audio segments by clipping. Split your audio tracks in accordance with the split size or duration you preset before converting, convertingor burning. Change the audio profile parameters for output customization; edit ID3 tag info of your audio tracks. Supports multiple CPU cores, multi-threading and batch process to speed up and simplify the conversion, convertingand burning. Options to auto exit application, shut down, hibernate, stand by system, or do nothing after conversion, converting, or burning to avoid waiting in front your computer. Comes with English, German, Spanish, French, Japanese, Chinese interface languages. Convert and extract DVD audio from DVD movies and convert them to MP3, WAV and other audio formats. iPhone Ringtone Maker is specially designed for you to make ringtone for your iPhone 4S/iPhone 4/iPhone 3GS/iPhone 3G. Download and convert YouTube videos to MP3, WAV, and MP2 files. Transfer any movie, video, audio file to iPod, transfer iPod files to PC/iTunes for backup.